U.S. and local partner forces were attacked Monday by what appears to have been a vehicle-borne improvised explosive device in northeastern Syria. The ISIS-affiliated Amaq News Agency took responsibility for the attack. “We can confirm a combined U.S. and Syrian partner force convoy was involved in an apparent VBIED attack today in Syria. There were no U.S. casualties," Army Col. Sean Ryan, a spokesman for the coalition to defeat the Islamic State, said in a statement. 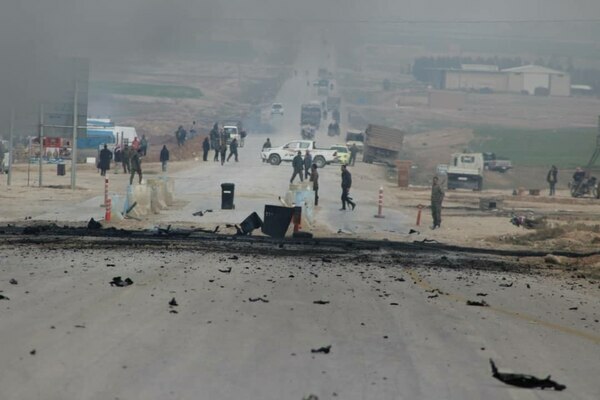 The attack occurred on a road outside Al-Shaddadi, a town in Syria’s Al-Hasakah province. The location is a roughly five-hour drive east of the site of the last bomb attack against U.S. troops in the town of Manbij. Al-Shaddadi was liberated from ISIS in February 2016. The targeted vehicle shown in pictures taken by local news media appears to be a Lenco BearCat. Commercial, off-the-shelf versions of those vehicles were approved as U.S. military aid to the SDF in September 2017. SDF press officials said in a statement that the VBIED was detonated prior to reaching the convoy. They died Wednesday in Manbij, Syria, from a suicide improvised explosive device attack. The SDF did not corroborate claims by the the Britain-based Syrian Observatory for Human Rights or other media outlets that Kurdish members of the SDF were wounded or killed. ISIS militants “launched a suicidal attack on the mission group via [an] explosive car, where our forces successfully dealt with the event and took the required measures to avoid losing causalities,” the translated SDF press release reads. The U.S. forces spokesman wouldn’t confirm any narrative of the incident. “I cannot get into specifics as we are conducting an investigation, however, no U.S. injuries,” Ryan said in an email. The attack occurred during a “routine field mission," SDF officials said, adding that ISIS has been “intensifying its attacks" as the group’s last stretches of physical territory dissolve across Syria. The idea that ISIS would transition to an insurgency after the fall of its caliphate is one that terrorism analysts have long warned was likely. Last week, a group of American military personnel and U.S. Defense Department civilians were attacked by a suicide bomber while conducting a meeting in a restaurant in Manbij. The deceased included two U.S. service members, one Defense Intelligence Agency civilian and one American contractor working as an interpreter. ISIS' suicide attacks come as the group is deteriorating across Syria, but especially in the Middle Euphrates River Valley near the Iraq-Syria border. Small villages are liberated from ISIS on a near-weekly basis, but the terror group has between 20,000 and 30,000 members distributed between Syria and Iraq, the United Nations Security Council said in a report this summer. While ISIS' presence isn’t in doubt, the question remains: Will the presence of U.S. troops in Syria beyond the defeat of ISIS' caliphate help deter the group, and at what cost? President Donald Trump voiced interest in leaving Syria over Twitter in December after news came that U.S. and SDF troops liberated Hajin, one of the last urban ISIS strongholds in the country. While Trump’s claim that “we have defeated ISIS in Syria” is doubted by many analysts, some do agree that leaving after ISIS' physical holdings are eliminated would be prudent. The White House signaled a fundamental shift in the military mission for troops in Syria that would focus on Iran rather than ISIS. “The argument that ISIS is going to come back if America leaves Syria seems spurious to me,” Joshua Landis, director of the Center for Middle East Studies at the University of Oklahoma, told Military Times in September. “What America is doing today, which is dividing Syria without spending significant money to rebuild, is going to open the doors for al-Qaida or ISIS to come back,” Landis said. “We’re just keeping this hollowed-out region, hollowed out."